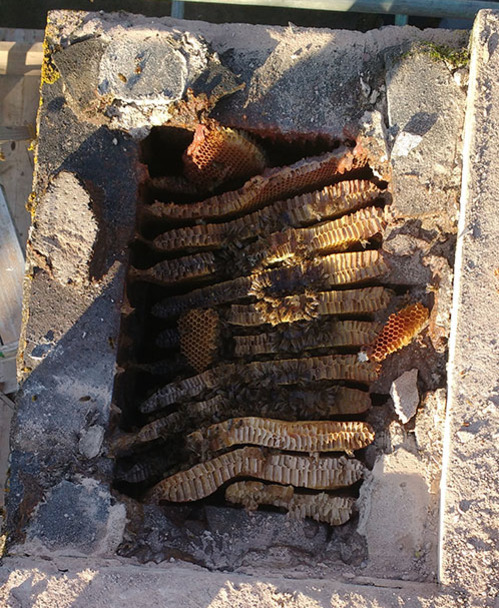 Receiving a telephone call from a home owner with bees in their chimney is not an unusual occurrence in my line of work. To get a telephone call from an agitated estate manager with a pressing problem is not usual. 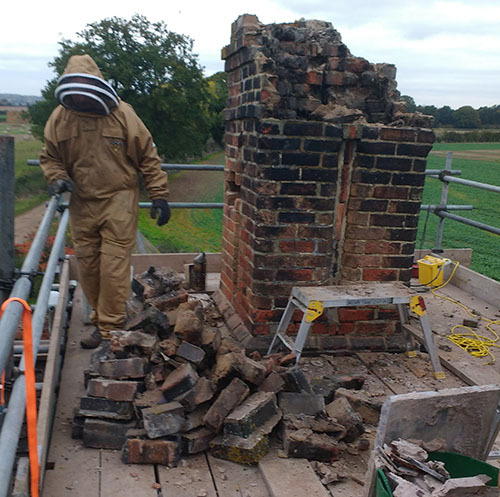 A cottage on an estate was to have its' two chimney stacks pointed as part of a renovation program, The call was pressing because scaffolding had been erected, builders engaged and the pointing of one of the chimney stacks completed, The other had some squatters, a colony of honeybees. The colony had been happily resident for sometime. Had the chimney not needed attention I guess they would still be there. The bees were not very happy about the disturbance caused by the renovations and where quick to remind anyone straying near the colony that this was their domain. To their credit the estate took the position that the colony was to be saved if it was at all possible. It was late October 2016 but the weather had not yet turned autumnal. 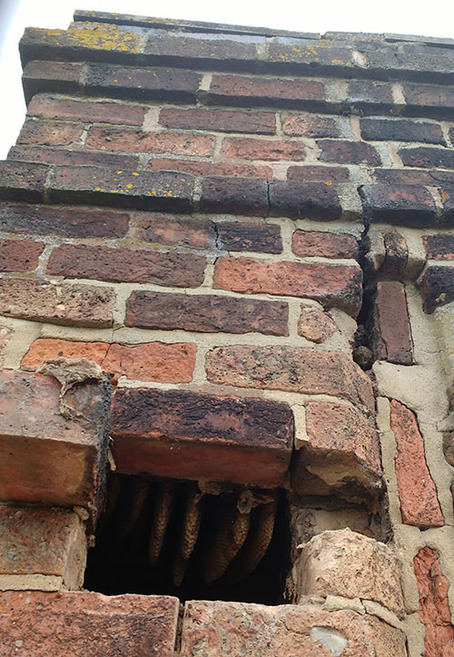 The fact a second decision was taken i.e to take down the chimney before it fell down, was actually a helpful one. Ian, the bricky (who was not a fan of honeybees), and I set about the colony and the soon to be demolished home. I had to estimate where the bottom of the colony might be. I took an educated guess and removed a brick. I was spot on. The top of the colony was fixed to the underside of the capping flags. The bottom was thirteen courses of brick lower. That is about five feet (1.5 metres). We inserted a board to stop any of the comb disappearing down the chimney, never to be seen again. 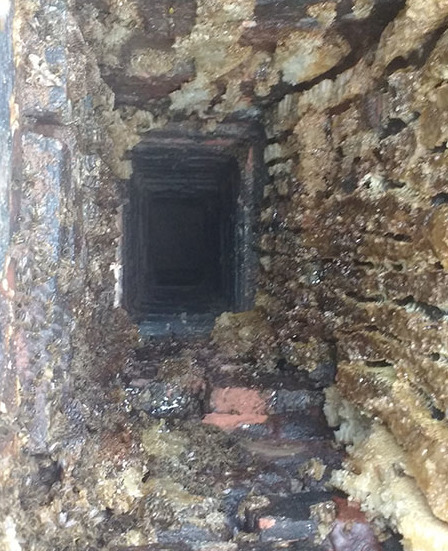 Having removed the top coping stone I found the chimney flue was 8 x 10 inches (200 x 250mm) and colony consisted of eleven combs. A few sums... one comb 200m wide and 1500mm long = o.3 square metres for one comb. Multiply o.3 by 11 [number of combs] and you get 3.3 square metres of comb. That's about 10 square yards of wax and remember it is double sided. The next part of the job is always the worst bit. I had the run my knife down the side of each the combs to detach it from the side of the chimney. The bees were given a whiff of smoke which was enough to make them vacate the comb I was working on. It took a good hour and a half to cut out all the comb. The comb was put in big buckets. As the comb was removed I checked for brood. This colony had no brood which not unusual for the late season colony. It made the job a bit easier. There was plenty of honey which oozed and squished between my fingers as I fought to remove the heavy comb. The bees where sweethearts, As I took away comb I shook the bees into my poly nuc. A poly nuc is a polystyrene nucleus box. It has six frames and a built in feeder on the side. essentially it is a half width hive. When I cut out some of the comb with honey in it I cut it to the size of the frame and popped the frame back in the poly nuc. The comb and honey smells of the colony so bees shaken into the poly nuc have something familiar around them. As usual not all the bees where on the comb and they would run away to a dark corner and cluster together (pictured right). I would then brush the bees into my hand and put them in the poly nuc with their sisters. 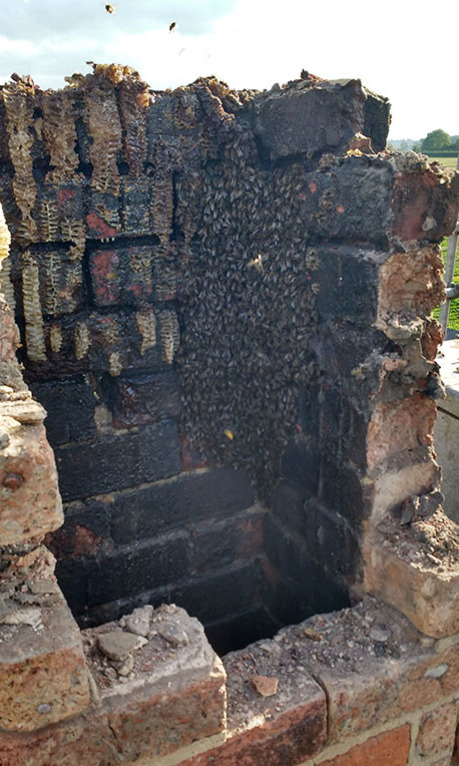 More bricks would be removed and the bees would re-cluster. 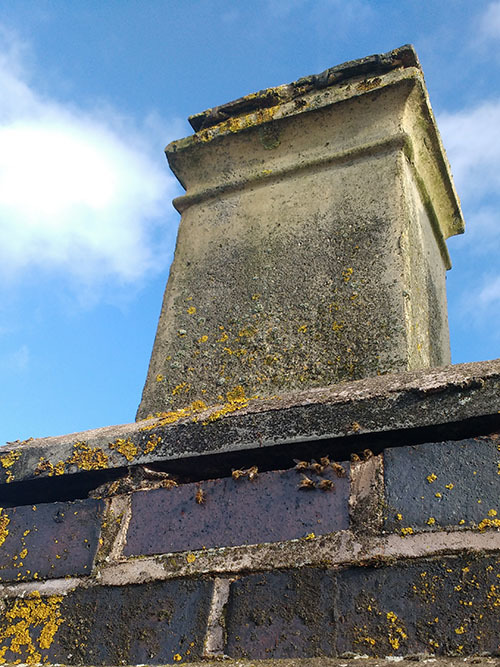 As the chimney disappeared the bees where collected over and over again. Once there are a lot of bees together in the nuc they tend to want to stay together. It was October and was a bit cool for flying. So being distrurbed then finding themselves in a warm, dark place with most of the their sisters and food encouraged them to stay in the nuc. I never saw the queen and was worried I might have squished her when removing the comb. There was lot of comb in this colony and the Queen can be very quick on her feet when disturbed. I was hoping she would keep running into the dark away from my destruction. I got to a stage where there was not many bees left in the chimney, frankly there was not much chimney left. The bees in the nuc where fanning on the entrance to the nuc which gave me reason to believe I may have caught the Queen. The last thing to do was to put a temporary cap on the chimney. The poly nuc was place on the cap roughly where the colony had been before just a lot lower down. I was sure that any flying bees would home in on the nuc. I topped up the feeder with syrup and left them for the weekend. The next Monday evening, at sunset, I collected the nuc and took it back to my apiaries to see if I can get it through the winter. Now the nuc is handy I can try to help the bees get through the winter. The bees have scoffed two litres of syrup in the week since they came down from the chimney. They have drawn out new comb on the empty frames of the nuc and the Queen has laid eggs! Well that is a good start. The bees are short of stores so I have refilled the liquid feeder. Whilst the weather remains warm they will draw wax. The picture left is a emergency frame feeder made by wrapping wire round a frame to create a pocket to hold a 2.5kg pack of fondant. 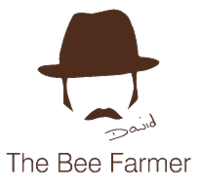 When the bees can no longer process the syrup they will be able to feed on the fondant in lieu of a stock of honey. You can see the bees are already checking out the fondant. If you look closely you will see the bee fanning (bums in the air) at the entrance to the nuc. They are saying come in, this where we live. Top right you can see a bee with pollen on its legs. They only need pollen when they are feeding brood. An indication the Queen is active. Things are looking up for this displaced colony. There was some Varroa mite damage in the old colony. 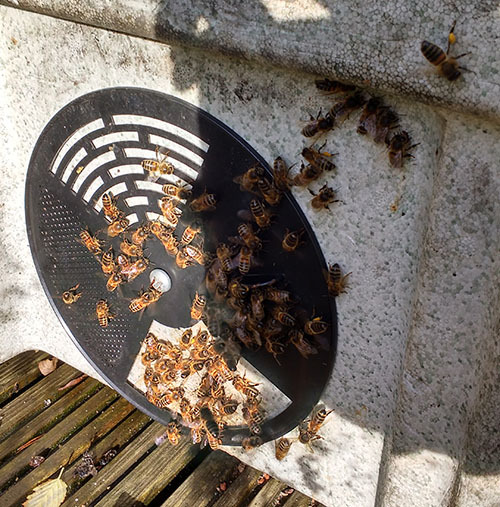 By creating a massive upheaval for the colony requiring them to make new comb we might have shaken off the mites to a level where they do not have a detrimental effect on the colony over the winter. The bees still have the challenge of the winter ahead. I will have to top the food up and keep the colony in a sheltered spot so they do not have to work hard to maintain the colony through the lean months. 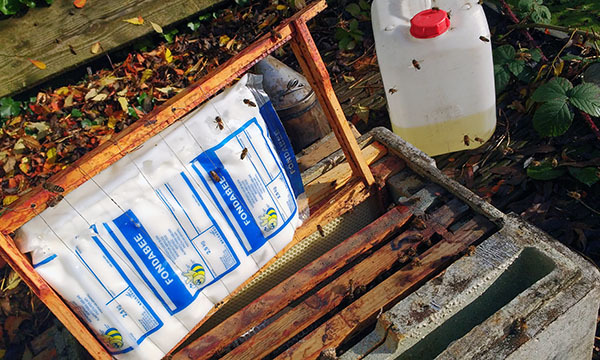 Saving bees from buildings requires a good deal of knowledge and husbandry but not to play down the role of a good helping of luck especially when working outside the normal bee keeping season. 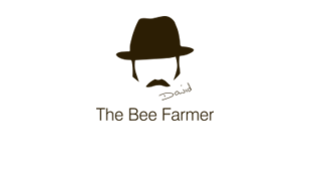 Just a note on Ian the bricky.....................He is now a fan of honeybees.